One of several reasons I bought my new cell phone was because I wanted to be more free to take snapshots wherever I bring it with me. Alas, it proved to not much of a reason. To date, I only managed to take a handful of candid snapshots with it. Which one of these should take the blame: a. my ignorance made me miss all the money shots; b. the kodak moment is non-existent; c. the moments are there but the circumstances just wasn’t right for me to flash my cell phone; d. all of the above. Anyway, here are some of the shots I’ve managed to take. Enjoy! 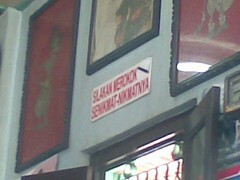 This was taken at Soto Kadipiro, a traditional eatery in Yogyakarta. It said “You may enjoy your cigarette deeply.” in Indonesian. You don’t see much of this benevolent kind of sign in Indonesia, where – like everywhere else in the world – smoking is getting more and more derided. Not that I’m against that, mind you. I’m all for it, in fact! 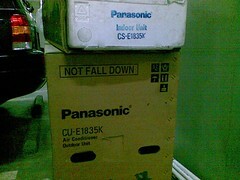 “Not Fall Down”?! Come on, Panasonic. Certainly you have an army of copywriters and editors in your packaging division. Tsk tsk tsk. That was a cardboard for an air conditioning unit. Now this is one of the remains of the great Jakarta flood of 2007. 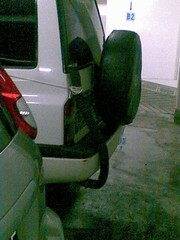 Many car owners prevented their car from shutting down as their exhaust pipe got blocked by the water by attaching flexible hoses to it. Kinda like those scuba snorkels, don’t you think? Re the Panasonic cardboard box, I do believe it’s just another example of Japanese Japlish. You should see some graphical samples here. Hilarious! This entry was posted on Thursday, 22 March 2007 at 08:44 and filed under Random Shots. You can follow any responses to this entry through the RSS feed. You can leave a response, or trackback from your own site.